As Australia and other regional allies prepares to receive their first F-35s, regional air forces have been modernising and expanding their own fighter fleets to bolster the combat capability of their fighter force. Fighter aircraft, like every facet of military technology, are rapidly evolving. The current global and regional transition from fourth to fifth-generation fighter aircraft, like the F-22 Raptor and F-35 Joint Strike Fighter platforms, is reshaping the role of fighter fleets and the balance of power in Australia's region. Designed to establish and maintain air superiority or air dominance, fighter aircraft have evolved from relatively simple, wood and canvas air frames during the First World War, to the highly manoeuvrable, long-range aircraft that dominated the skies of Europe and the Pacific during the Second World War; the latest two generations of fighters are the pinnacle of these earlier designs. Indo-Pacific Asia's fighter fleets are made up of fighter aircraft ranging from third to fifth-generation aircraft, each with unique capabilities and roles within the regional balance of power. Third-generation fighter: Designed and developed between the early 1960s and the 1970s, these aircraft placed renewed focus on manoeuvrability and traditional ground attack capabilities. Third-generation aircraft also saw the increased use of guided missiles in combat, the introduction of analogue avionics systems and improved aerodynamic performance. Examples of third-generation fighter aircraft include the US F-4 Phantom II, the French Mirage F1, the Russian MiG 25 Foxbat and Chinese Shenyang J-8. Fourth-generation fighter: Developed and in service from about 1980 until the present, fourth-generation fighter aircraft placed renewed emphasis on manoeuvrability and air-to-air combat capability, supported by improved fly-by-wire flight control systems, improved avionics, the introduction of digital computers, aerodynamic air frames and on board radar systems to leverage advances made in long-range air-to-air missiles. Fourth-generation combat aircraft also marked the the introduction of multi-role fighter aircraft. Examples of fourth-generation fighter aircraft include the US F-15 Eagle, F-14 Tomcat, F/A-18 Hornet, Russian MiG-29 and Su-27, French Rafale, Eurofighter Typhoon and Chinese Shenyang J-10 and J-11. 4.5 generation fighter: Evolved variants of the fourth-generation, incorporating advances in microchip and semiconductor technology to improve avionics, radar, data links and network-centric warfare. Additionally, these aircraft incorporate advances in radar cross section reducing design and materials, advanced GPS guided weapons and in some cases thrust vectoring. Examples of 4.5 generation aircraft include the US F-15E Strike Eagle and F/A-18 E/F Super Hornet, the Russian Su-30MKI and MKK variants, Eurofighter Typhoon and Rafale variants. Fifth-generation fighter: The pinnacle of fighter aircraft, incorporating all-aspect stealth even when armed, low-probability-of-intercept radar, high-performance air frames, advanced avionics and highly integrated computer systems, these aircraft provide unrivalled air dominance, situational awareness, networking, interdiction and strike capabilities for commanders. Examples of fifth-generation aircraft include the US F-22 Raptor and F-35 Joint Strike Fighter, Russian Su-57 and Chinese J-20 and FC-31. In the first instalment, we will take a closer look at the operational fighter fleets of China, Russia and India. People's Liberation Army Air Force: China's Air Force has undergone a period of modernisation and expansion in line with the country's growing ambitions in Indo-Pacific Asia. Part of this program has seen an expansion in the PLAAF's fourth-generation aircraft fleets and increased investment and development of domestically designed fifth-generation platforms. Xian JH-7: Similar in role to the retired F-111, the JH-7 is a fighter-bomber in operation with both the Chinese Air Force and Chinese Naval Air Force. The fourth-generation aircraft has a combat radius of about 1,760 kilometres, max speed of Mach 1.75 and capable of carrying a variety of Chinese made air-to-air, air-to-ground and air-to-surface munitions, including 'dumb' and 'smart' bombs with a maximum load capacity of about 20,000 pounds. Shenyang J-8: A Chinese developed interceptor, in operation with both the Chinese Air Force and Chinese Naval Air Force. The specialised fighter aircraft has a combat radius of 1,000 kilometres, max speed of Mach 2.4 and never exceed speed of Mach 2.2, and is armed with a variety of weapons, with a central 23mm cannon and under-wing hardpoints for fuel, bombs, rockets or missiles. Chengdu J-10: China's fourth-generation multi-role combat fighter, comparable to the US F-16 series of fighters. The J-10 is currently operated by both the Chinese Air Force and Chinese Naval Air Force. The aircraft has a combat radius of 550 kilometres and max speed of Mach 1.8. J-10 is armed with a single 23mm cannon and has 11 under-wing hard points with capacity for 7,000 kilograms worth of external fuel stores and Chinese made air-to-air, air-to-ground and air-to-surface munitions, including 'dumb' and 'smart' bombs. Chengdu J-11: A Chinese variant of the Soviet Su-27SK air superiority fighter. The J-11 and its variants (from J-11B on) includes the J-15 carrier-based variant have a combat radius of about 1,500 kilometres and a max speed of Mach 2.35. The fighter is armed with a single 30mm cannon and has 10 hardpoints capable of carrying a variety of Chinese made air-to-air, air-to-ground and air-to-surface munitions, including 'dumb' and 'smart' bombs. Shenyang J-16: A Chinese produced variant of the Russian Su-30MKK series and the Chinese produced J-11B. The aircraft has a range of about 3,900 kilometres and max speed of Mach 2.5. The aircraft is armed with a single 30mm cannon and incorporates 12 hardpoints capable of carrying a variety of Chinese made air-to-air, air-to-ground and air-to-surface munitions, including 'dumb' and 'smart' bombs. Sukhoi Su-30: Both the Chinese Air Force and Naval Air Force operate the Soviet designed Su-30 series aircraft. Su-30 has a max speed of Mach 2 and range of about 3,000 kilometres. The aircraft is armed with a single 30mm cannon and 12 hardpoints capable of carrying a variety of Russian and Chinese made air-to-air, air-to-ground and air-to-surface munitions, including 'dumb' and 'smart' bombs with a maximum load capacity of about 18,000 pounds. Sukhoi Su-35: An evolution of the Su-30 series, the Su-35 provides the Chinese Air Force with a 4.5 generation fighter aircraft, incorporating thrust vectoring engines, with a max speed of Mach 2.25 and combat range of about 1,580 kilometres. The aircraft are armed with a single 30mm cannon and are equipped with 12 hardpoints capable of carrying a variety of Russian and Chinese made air-to-air, air-to-ground and air-to-surface munitions, including 'dumb' and 'smart' bombs with a maximum load capacity of about 18,000 pounds. Chengdu J-20: China's first fifth-generation fighter aircraft, and the world's third such aircraft, incorporates radar reducing cross sections and materials, high-capacity sensor integration and advanced engines. While little is known about the specifics of the fifth-generation air superiority fighter, designed to counter the American F-22 Raptor, it has a max speed of Mach 2.5+ and incorporates a variety of advanced Chinese designed precision-guided bombs, and air-to-air missiles in internal weapons bays and advanced electro-optical targeting systems and active electronically scanned array (AESA) radars. 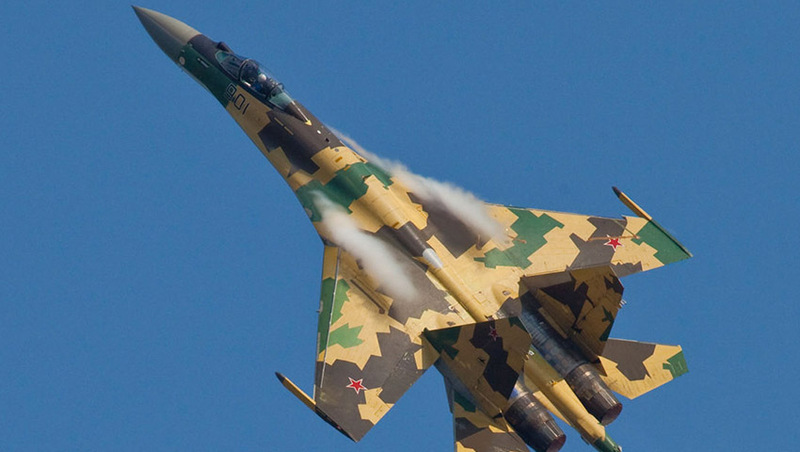 Russian Air Force: Russia's Air Force has inherited a variety of Soviet-era fighter aircraft designs, which has up until recently placed the Air Force at a disadvantage as regional nations introduce more advanced aircraft into their own fleets. Sukhoi Su-27: A twin-engine, super-manoeuvrable fighter aircraft designed to counter American fourth-generation fighters like the US F-14 and F-15 aircraft. The Russian Air Force operates a variety of the Su-27 variants across its 37 fighter squadrons. The Su-27SK variant, which serves as the base model for the Russian operated variants, has a range of between 1,340 kilometres (at sea level) and 3,530 kilometres (at altitude) and a max speed of Mach 2.35. The aircraft is armed with a single 30mm cannon and has 10 hardpoints capable of carrying a range of Russian made air-to-air, air-to-ground and air-to-surface munitions, including 'dumb' and 'smart' bombs with a maximum load capacity of about 10,000 pounds. Sukhoi Su-34: A Soviet answer to the F-111 fighter-bomber, the Su-34 provides the Russian Air Force with a credible, high-capability, long-range fighter-bomber. The Su-34 has a combat range of about 1,100 kilometres, a top speed of Mach 1.8+ and is armed with a single 30mm cannon. As a fighter-bomber, the Su-34 has 12 hardpoints capable of carrying a range of Russian made air-to-air, air-to-ground and air-to-surface munitions, including 'dumb' and 'smart' bombs with a maximum load capacity of about 17,600-26,500 pounds. Sukhoi Su-35: An evolution of the Su-30 series, the Su-35, like the capability delivered to the Chinese Air Force, provides the Russian Air Force with a 4.5 generation fighter aircraft, incorporating thrust vectoring engines with a max speed of Mach 2.25 and combat range of about 1,580 kilometres. The aircraft are armed with a single 30mm cannon and are equipped with 12 hardpoints capable of carrying a variety of Russian made air-to-air, air-to-ground and air-to-surface munitions, including 'dumb' and 'smart' bombs with a maximum load capacity of about 18,000 pounds. Mikoyan MiG-29: Designed in the mid-1980s, the MiG-29 aircraft provides the Russian Air Force with an early-fourth-generation multi-role fighter aircraft similar to the American F-16 and F/A-18 series fighter aircraft. The MiG-29 has a range of about 2,100 kilometres and max speed of Mach 1.13 (at sea level) and 2.25 (at high altitude) and is armed with a single 30mm cannon and nine hardpoints for carrying a variety of Russian made air-to-air, air-to-ground and air-to-surface munitions, including 'dumb' and 'smart' bombs with a maximum load capacity of about 12,000 pounds. Mikoyan MiG-31: Designed at the height of the Cold War as a high-altitude, high-speed fighter interceptor to counter high-altitude US strategic bombers, the MiG-31 has a combat range of 1,450 kilometres with a max speed of Mach 2.83 and can be armed with a variety of Russian made air-to-air and air-to-surface munitions. Sukhoi Su-57: Russia's answer to the American F-22 Raptor and the Chinese J-20, the Su-57 is intended to succeed the MiG-29 and Su-27 series fighters in Russian service. The twin-engine, multi-role air superiority fighter aircraft is the first Russian aircraft to incorporate radar reducing cross sections and materials, high-capacity sensor integration and advanced engines. Su-57 has a supersonic range of about 1,500 kilometres and subsonic range of 3,500 kilometres and max speed of Mach 2. The aircraft is armed with a single 30mm cannon and between 12 and 16 hardpoints, including internal weapons bays capable of Russian made air-to-air, air-to-ground and air-to-surface munitions, including 'dumb' and 'smart' bombs. Despite modernisation efforts made by the Russian government, significant recapitalisation programs for Soviet-era platforms like the MiG-31 and Su-27 series fighter aircraft will see a series of advanced 4.5 and fifth-generation combat fighter aircraft, including the Su-57; the 4.5 generation MiG-35, an evolution of the MiG-29; and the MiG-41 a fifth-generation, high-altitude, high-speed interceptor replacement for the MiG-31 expected to be introduced into service 2025. This expansion is planned to be supported by expanding the export success of Russia's fighter aircraft, with the Su-57 and modernised variants of the Su-27 and Su-30/35 series fighter aircraft enabling the Russian Air Force to lower the research and development and corresponding unit costs for advanced platforms moving forward. Indian Air Force: The Indian Air Force, like its Russian and Chinese counterparts, is undergoing a series of modernisation and recapitalisation programs to phase out older generation fighter aircraft with foreign designed and manufactured fighter aircraft. India's pursuit for a modern fighter force also aims to help develop the country's own aerospace manufacturing industry. Mikoyan MiG-29: Designed in the mid-1980s, the MiG-29 aircraft serves the Indian Air Force with an early-fourth-generation multi-role fighter aircraft similar to the American F-16 and F/A-18 series fighter aircraft. The MiG-29 has a range of about 2,100 kilometres and max speed of Mach 1.13 (at sea level) and 2.25 (at high altitude) and is armed with a single 30mm cannon and nine hardpoints for carrying a variety of Russian and Indian made air-to-air, air-to-ground and air-to-surface munitions, including 'dumb' and 'smart' bombs with a maximum load capacity of about 12,000 pounds. Sukhoi Su-30MKI: Expected to form the backbone of India's modern air force, with 272 currently on order and 233 in operation, the Soviet designed Su-30MKI variant has a max speed of Mach 2 and features thrust vectoring control and canards for super-manoeuvrability and range of about 3,000 kilometres. The aircraft is armed with a single 30mm cannon and 12 hardpoints capable of carrying a variety of Russian and Indian made air-to-air, air-to-ground and air-to-surface munitions, including 'dumb' and 'smart' bombs with a maximum load capacity of about 18,000 pounds. Mirage 2000: The French designed multi-role third-generation multi-role fighter aircraft has been in service with the Indian Air Force since the 1980s. The Mirage has a range of about 1,550 kilometres and a max speed of Mach 2.2 at high altitude. The nimble fighters are armed with twin 30mm cannons and have nine hardpoints for integrating a range of French, Russian and Indian made air-to-air, air-to-ground and air-to-surface munitions, including 'dumb' and 'smart' bombs with a total capacity of 13,900 pounds. Dassault Rafale: Another French designed combat aircraft, the Rafale provides the Indian Air Force with a fourth-generation combat fighter, with a combat range of about 1,852 kilometres and max speed of Mach 1.8. The Rafale is armed with a single 30mm cannon and 14 hardpoints for integrating French and US made air-to-air, air-to-ground and air-to-surface munitions, including 'dumb' and 'smart' bombs with a total capacity of 20,900 pounds. HAL Tejas: The Indian designed and manufactured multi-role, light fighter is India's first attempt to develop a fourth-generation fighter aircraft and builds on the experiences learnt from participating in the the manufacturing and operation of foreign designed aircraft. The Tejas has a combat radius of 500 kilometres and max speed of Mach 1.8 (full-rate production model), and is armed with a single 23mm cannon and eight hardpoints for integrating a range of Russian and Indian air-to-air, air-to-ground and air-to-surface munitions, including 'dumb' and 'smart' bombs. India's Air Force modernisation program will see a number of continuing transformations, including the introduction of a fifth-generation fighter aircraft. Designated the Advanced Medium Combat Aircraft, it is designed to complement fourth- and 4.5 generation fighter aircraft and replace the ageing Mirage 2000 aircraft. Additionally, the Indian Air Force is looking to introduce 200 new, single-seat, single-engine fighter aircraft, with the Lockheed Martin F-16 Block 70 and Saab Gripen fighter aircraft. It is expected that the procurement will also see increased Indian industry involvement as part of the Indian government's goal of developing a capable domestic aerospace and advanced manufacturing industry. In the second edition, we will take a look at the growing and evolving fighter fleets of Vietnam, Singapore, Malaysia, Indonesia and Thailand.